The astronomical clock on the Olomouc town hall is one of only two in the country and is interesting because it represents the first real effort at organizing society according to the 24-hour clock, hundreds of years before the industrial revolution. The Olomouc clock is also quite unique because it was remodelled during the first years of communism in the style of social realism. When that regime fell at the end of the 1980's, most of the prominent statues and monuments were removed, but the clock in Olomouc survived and offers a rare glimpse into the communist era with massive mosaics of workers and scientists and a dial that turns to display the International day of the Worker and the birthdays of Lenin and Stalin. What makes an astronomical clock different from a normal clock exactly? 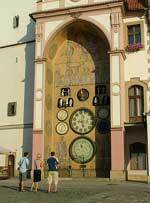 Well, the Olomouc clock shows the hour and minute of course, but also the day of the week, month, phase of the moon and a star map which revolves to indicate the visible part of the night sky. On the upper dial are the four seasons, and the twelve houses of the zodiac representing the twelve segments of the sky. Against this background revolve the earth and the other five planets known at the time. 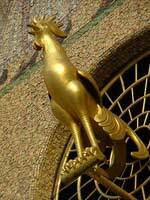 What and when is your name day? 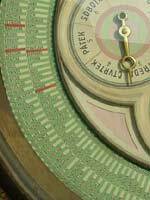 Another interesting thing on the large lower dial is the outer ring painted in green and white stripes with a name on each one. If you find the gold stripe, you’ll see that there are 365 of these names, so one for every day of the year. St Valentine is probably the most well known in many countries, but every day of the year has its patron saint, and Czechs celebrate their name day something like a second birthday. Your actual birthday is still celebrated, but for example, if your name is Martin, you’d also celebrate St Martin’s day; November the 11th. If your name is Valentin, no matter on what day you were born, you would also celebrate the 14th February. The days highlighted in red are the old communist holidays. There are some interesting tales connected with these, like the deaths of Stalin and Gottwald, which the clock tells us were just two weeks apart in early 1953. Klement Gottwald was the first communist president of Czechoslovakia, and met his end by famously underestimating Moscow weather. He caught a severe chill at Stalin’s funeral and because of it was soon in the grave himself. 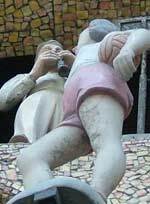 At 12 noon every day, the clock marks the hour by playing three pieces of music, while the figures rotate. The whole performance takes 6 or 7 minutes and is probably not going to blow your socks off. It is worth staying to the end though, even if just to see people get annoyed that there are no fireworks or laser lights and stalk off impatiently to scoff. Others think the performance is hilarious and go away laughing and clapping. Whatever you think of the noon performance, it’s worth remembering that the clock is one of only a few left in the world. And they’re not making any more.